farewell as the Raymond Street jail closes July 20, 1963.
. . . from when Brooklyn was a city. The Raymond Street Jail, long gone from Brooklyn, can be revisted via a virtual tour, thanks to retired C.O. Peter J. Ledwith graciously allowing NYCHS to present this selection from his vintage photos collection. with the modern high-riser's window air conditioners. NYCHS scanned the early 1960s B&W prints -- now brown-ish from aging -- into digtal images and combined them with annual report excerpts about what many called Brooklyn's Bastille. Return to Raymond St. Jail includes two pages of annual report text, each page with 12 blue-bordered images. The text, beginning below, describes the jail built in 1838 but still in operation 125 years later. Peter Ledwith in his NYC DOC Pipe Band days. Each blue-bordered image is linked to a separate page with a very large version of that image. Double-clicking a blue-bordered image will take you to its bigger version. Besides displaying the larger image version, each of the 24 single large image pages features caption material and navigation links. The caption material includes information provided by Ledwith. Navigation options include returning to the annual report excerpts page at the point you left it or going directly to the next large image page. You can keep using the Next Large Image links to navigate the entire series of large images directly without returning to the text pages but we really do recommend also reading the annual report excerpts because they provide information about the facility and its operations seen in the images but not covered in the brief captions.The annual report excerpts pages also include additional images not in the series of large image pages. NYCHS expresses appreciation to retired Officer Ledwith for sharing with us and with our web visitors this selection of photos from his collection, thereby making possible our Return to Raymond St. Jail. In 1686, exactly 270 years ago, a small unpretentious building was erected in Flatbush as the first county jail and courthouse. This building, together with the second Flatbush county jail and courthouse, erected in 1758, was an example of the punitive attitude of the community toward prisoners. Although it was larger and more pretentious, the second jail was, penologically speaking, no improvement over the first. It was two stories high; the lower floor being the jail, with the court room on the second story. The jail itself was grim and gloomy, lighted only by two grated windows opening into the streel or common. Something between a dungeon and a blockhouse, it was constructed of heavy oak planks, fastened to solid timbers of the same by heavy wrought-iron spikes driven a few inches apart. The floor was made of heavy oak timbers, about five inches thick; the planks running diagonally, and defended by heavy iron bars, running horizontally across the door. Below: Civil jail or annex. Towards the top of the door was a diamond-shaped opening, about eight inches in area, strongly bound by iron. The hinges and lock were very heavy; taken together, the door was a massive unwieldy affair. Prisoners were herded into this dungeon with no thought of the misery they would endure and with no recognition of the fact that these same ponderous doors would some day open to readmit them to the community worsened and embittered by their experience. These prison outcasts were held in so little human regard that during the Revolutionary War while the British were in possession of Long Island, the upstairs court room above the jail was converted into a ballroom. Above: Civil jail, another view. Here for several years elegant English officers, with their wives, daughters, and the wives and daughters of their Tory friends, joined to trip the light fantastic with no thought of the prisoners below. In 1793 this building was replaced by the third courthouse and jail at Flatbush. The new building, much larger than its predecessor, in keeping with the increased wealth and population of the county, was built on much the same philosophy. It had a double pitch or curved roof, and was surmounted by a small cupola. Like the former building, the court room was on the second floor and was used for school exhibitions, town meetings and other public gatherings. Representing no penological advance, it had the additional disadvantage of inadequate security. Prisoners so frequently escaped from this jail that it was often facetiously remarked prisoners were in great danger of falling out of the Flatbush Jail. On November 30, 1832, the building took fire and was burned to the ground. From that time until the erection of the Raymond Street Jail in Brooklyn, prisoners arrested in Kings County were sent to the old Bridewell Prison located in New York City Hall Park. Above: Kross, aides on steps. Below: On the center flats. At this time Flatbush ceased to be the County Town of Kings County; its courts and all its judicial and other business were transferred to Brooklyn. The cornerstone of Raymond Street Jail for male prisoners was laid with appropriate ceremony on August 27, 1836 in the Fort Greene Park district of Brooklyn at Raymond and Willoughby Streets (Raymond Street is now Ashland Place). 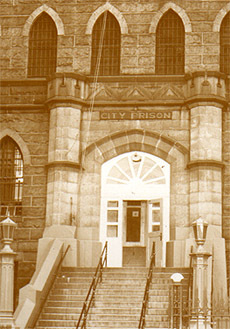 An addition for women prisoners, later known as the "Annex," was completed in 1839. 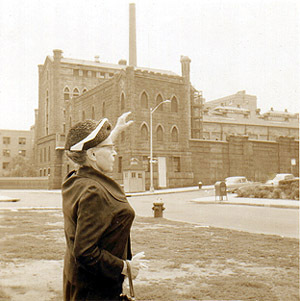 Forty years later, Brooklyn, now a separate city with a population of 750,000, expanded its prison facility, until in 1879, the prison was renovated into the greystone bastille known as the Raymond Street Jail which is now relegated to the pages of history and supplanted by the new Brooklyn House of Detention for Men. Although Brooklyn officially became part of the City of New York in 1898, this jail, operated jointly with the Kings County Penitentiary until 1907, was under the jurisdiction of the Sheriff of Kings County. Below: Upper center's 1 hour out. Males were confined in dark, smelling cells with no light whatever, except that furnished from a flicker of a candle, a luxury to be enjoyed by those who had the means to procure this and at an exhorbitant price. The odor arising from the cells was almost unbearable. In the female's prison, some eighty years ago, the conditions were largely the same. In 1909, the female prison, then seventy years old, was torn down and the entire institution was rebuilt between then and 1911 at a cost of $350,000. 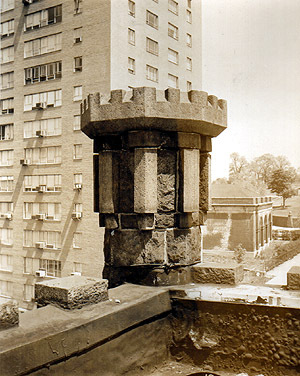 Further improvements and modifications were made, in 1914 and 1915, but still the Raymond Street Jail, modelled after a West Point fortress, was evidence that attitudes towards prisoners had not changed in proportion to the technological advances made in almost 300 of Brooklyn prison history. Above: Level over center flats. Below: South 1's "inside walk." This fact was symbolically illustrated when the building was first planned. By a slight oversight on the part of the architects and the supervisors, when the building was completed, they found there was no front door! Afterwards, of course, money was allocated to cut out a door where it ought to have been in the first place. Figuratively speaking, the tradition of prison historv has consistently reflected this oversight. The entire history of prison construction has indicated a wrong awareness of doors -- and of the fact that the same doors which open to admit prisoners, will some day open to release them again to the community. The new House of Detention for Men in Brooklyn represents our determination never to forget the door again. It will be a better protection from crime for the 3,000,000 inhabitants of Brooklyn. This new prison will provide the physical framework for modern programs of inmate treatment and rehabilitation which were impossible to implement in the inadequate and overcrowded Raymond Street Jail. Instead of releasing inmates to the community further corrupted by their prison experience, in this new House of Detention for Men we will remember that prison doors open both ways and will so attempt to fulfill the true meaning of the word Correction. To Part 2 of Return to Raymond Street Jail.